Cannoli Cream Chocolate Truffles, an easy homemade no-bake dessert! 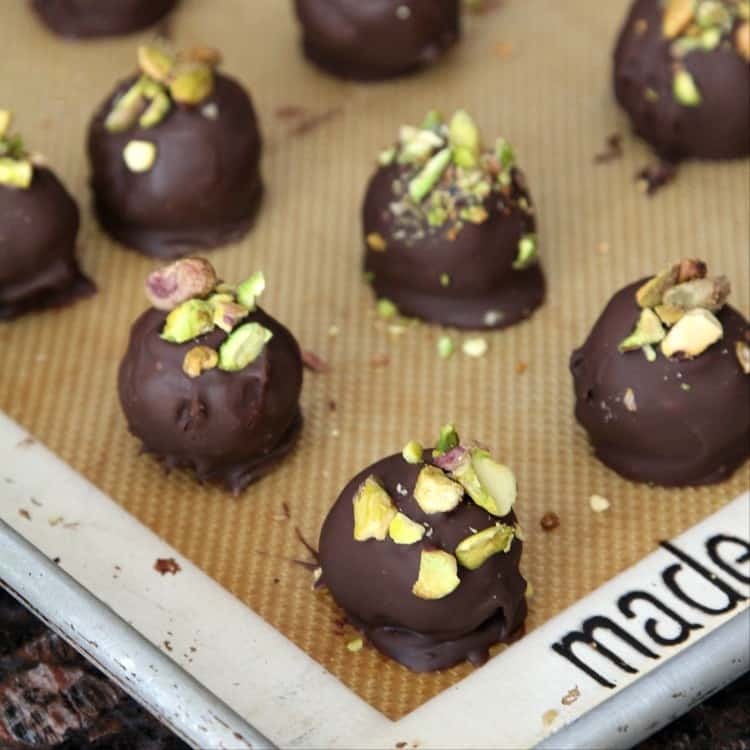 Learn how to make truffles with a cannoli filling like the popular Italian pastry. This simple candy recipe is ready in no time! 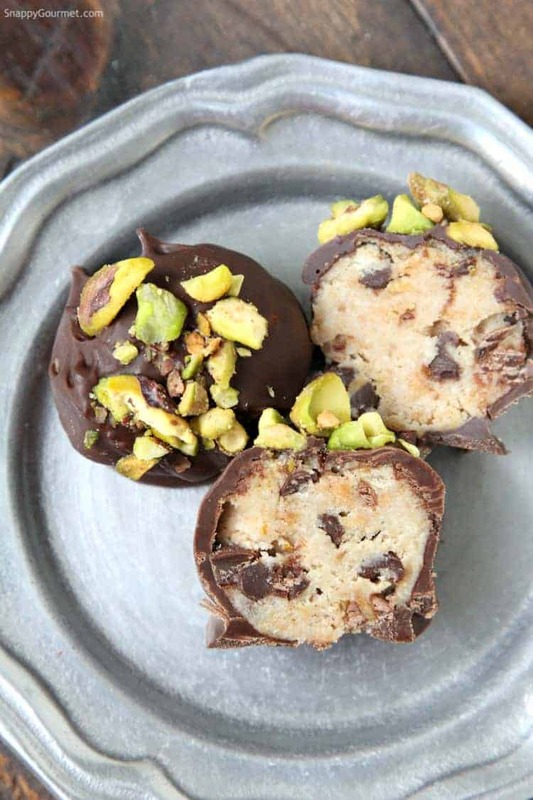 These Cannoli Cream Chocolate Truffles are yet another addition to my cannoli craze recipes! 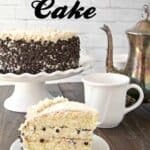 My other cannoli recipes like my Cannoli Cake, Cannoli Cookies, Cannoli Dip, and Mini Cannoli Dip Cups have been so popular lately! Thankfully, we’re talking about the candy variety here and not chocolate covered mushrooms. Candy truffles are generally soft. They are typically round and rolled in cocoa powder or other things such as nuts, sprinkles, or a wide range of other things. Sometimes the centers are flavored with alcohol or other fillings. For these Cannoli Cream Chocolate Truffles, I decided to dip them in melted chocolate for a hard shell. However, you could try other coatings on the outside. The filling though is a bit soft so may not hold up as well with a soft coating on the outside such as cocoa powder. A cannoli is an Italian pastry. For more information and photos, visit What is a Cannoli. 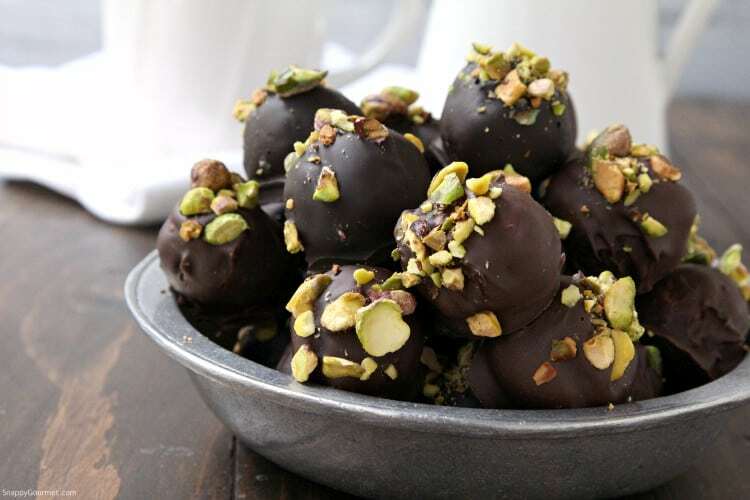 The filling of these truffles is based on a cannoli and similar to the cannoli filling. Please note though that these truffles do not taste EXACTLY like a cannoli. They are candy and if you want something that is EXACTLY like a cannoli, buy a cannoli. haha! Just putting that out there before I get hate mail. Depending on where you live and where you get a cannoli, they can vary. So feel free to adjust the recipe based on your favorite cannoli. 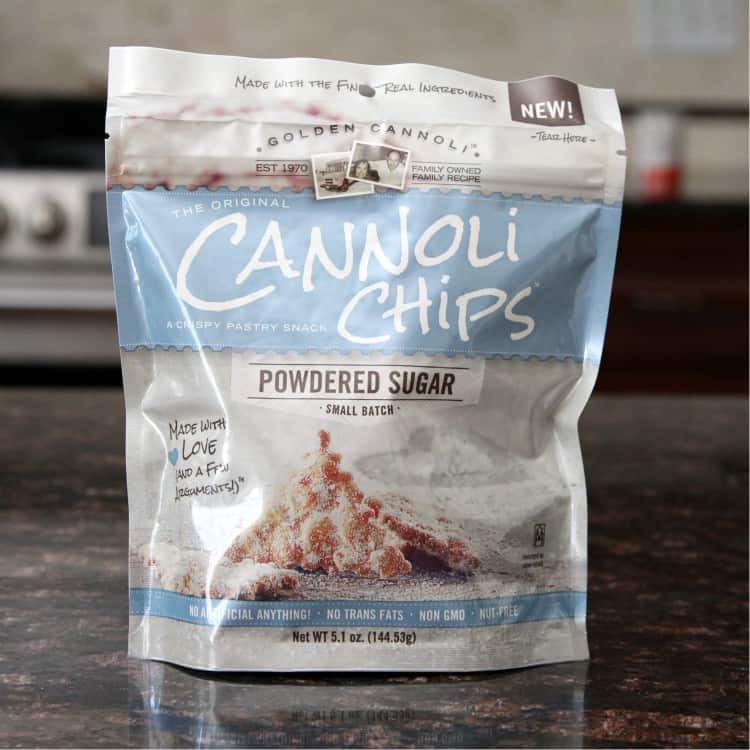 To start, get yourself a bag of Cannoli Chips. I have seen these popping up in more and more stores but you can also buy online. Be sure you get the powdered sugar variety. If you can’t find the chips, you can try other things such as unfilled cannoli shells, graham crackers, vanilla wafers, etc. but you may need to adjust the sugar in the filling. I haven’t tried these though, so can’t say for sure how they taste or will hold up in the recipe. 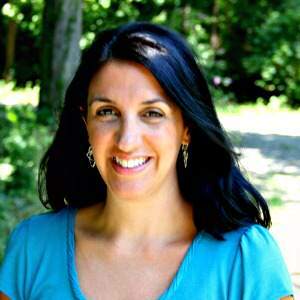 Place the cannoli chips in a food processor and process until coarse crumbs. 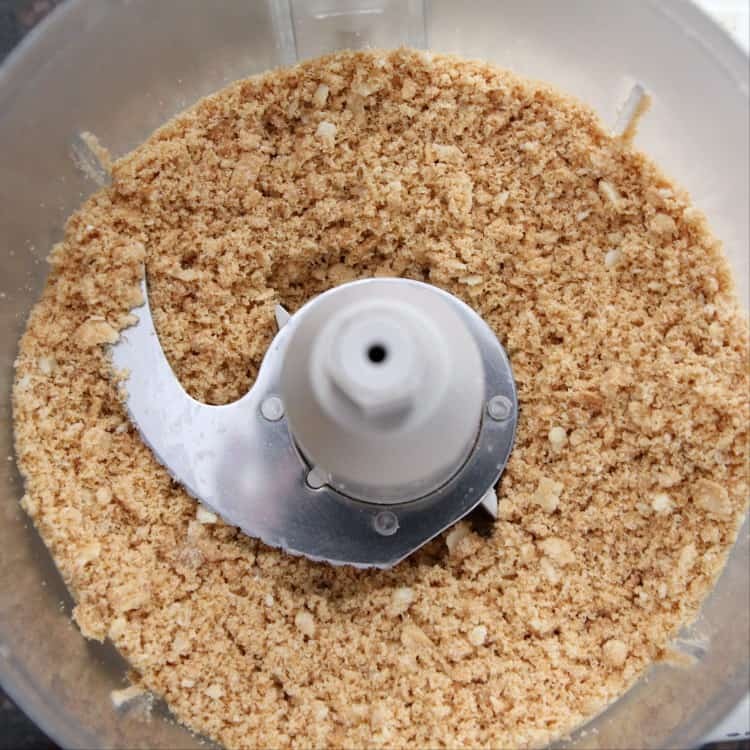 the crumbs shouldn’t be SUPER fine crumbs, but you don’t want huge chunks either. If you don’t have a food processor you can place the chips in a resealable bag and roll over the bag with a rolling-pin until you get crumbs. Pour the crumbs in a mixing bowl and mix in the powdered sugar, orange zest, cinnamon, and salt. Then, mix in a little of the ricotta cheese at a time until a soft dough forms. You may need more or less ricotta depending on the type of ricotta you use. Some ricotta is more “watery” than others. You can drain your ricotta ahead of time so that it’s thicker. 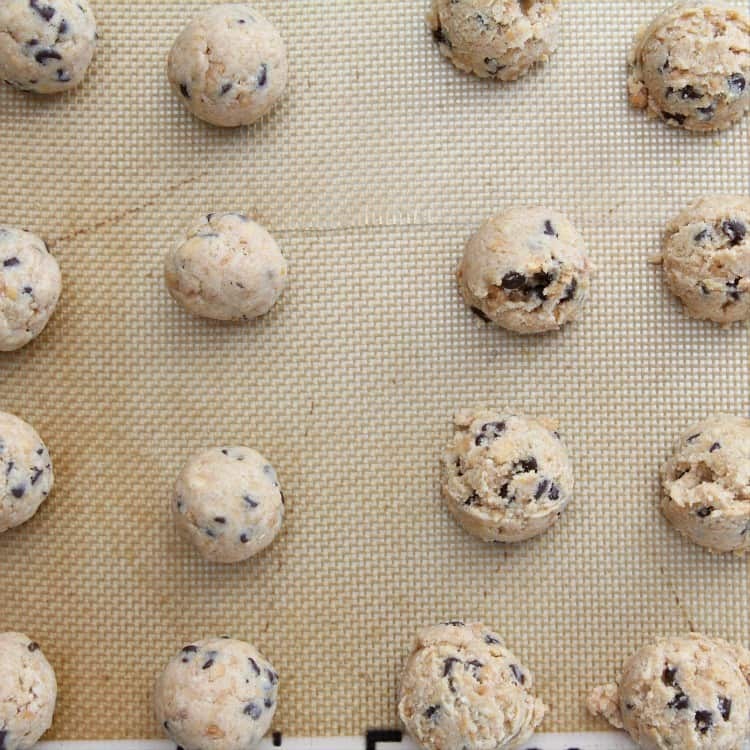 The dough should be almost like a soft cookie dough. Be careful not to add TOO much ricotta. 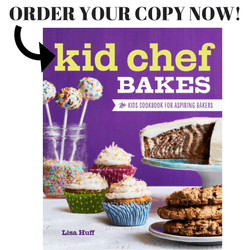 You want the dough to be able to stay in a ball. Then mix in the vanilla extract and mini chocolate chips. Use a small ice cream/cookie scoop or spoon and scoop the dough onto a silicone mat or parchment paper-lined baking sheet. You can, however, make these truffles bigger or smaller based on your personal preference. Then roll each one into a ball with your hands. Place them back on the lined baking sheet and refrigerate about 15-20 minutes or until the balls are chilled and firm. Next, you’ll need some melted chocolate for the outside of the truffles. I used the remaining chocolate chips from a bag of mini chocolate chips (plus a little more…) but you can use chocolate bars, chopped chocolate, candy melts, or anything you have good luck with. Please note that some chocolate melts better than others, especially chocolate chips. Some brands of chocolate chips melt better than others so use whatever you have good luck with. I added a little vegetable oil to my mini chocolate chips to help for a smoother consistency. Depending on the size of your truffles and how thick you want the outside, I’d estimate you’ll need about 2 cups of melted chocolate. Make sure your melted chocolate is fairly cool before you dip the candy. Remove the candy from the fridge. Using a fork or some type of candy dipper, dip each candy ball in the melted chocolate and place back on the lined baking sheet. 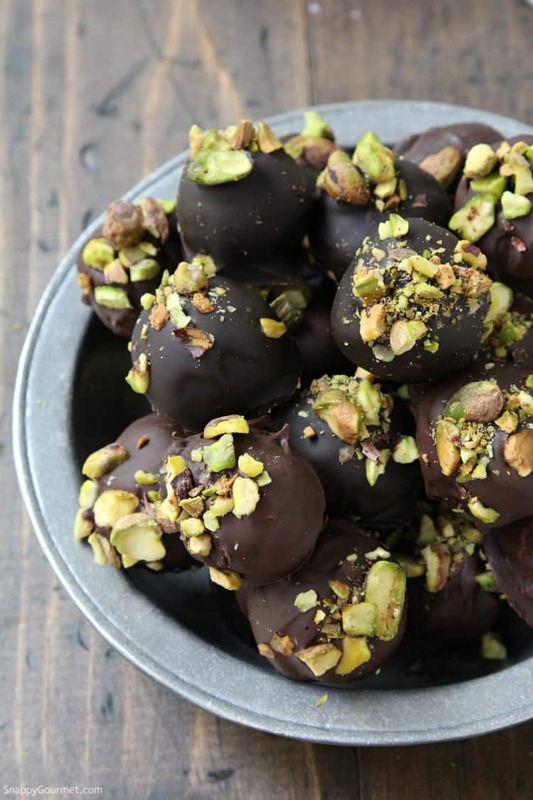 Before the chocolate sets on the outside, sprinkle chopped pistachios on top. Place the truffles back in the refrigerator for about 5 minutes or until set. Store in fridge until ready to serve. Instead of pistachios, you could drizzle more chocolate (or white chocolate), or use chopped walnuts, pecans, or almonds. Or you could also use mini chocolate chips or candied orange peel. 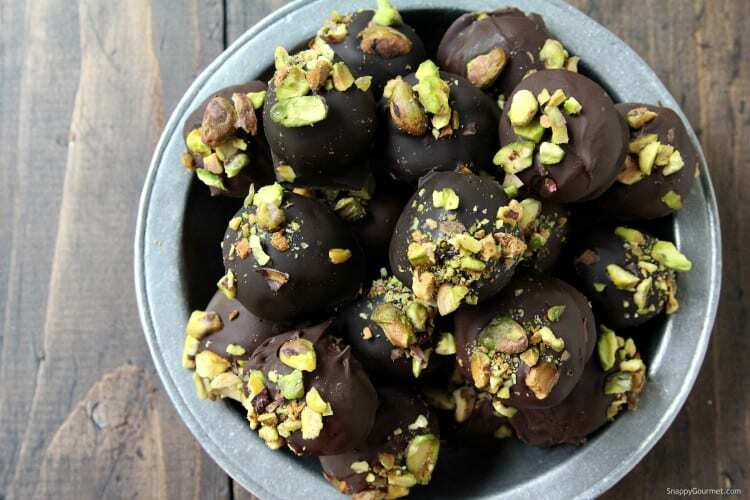 These chocolate truffles will last awhile in the fridge but are best within a few days. Since they have ricotta in them, I’d suggest keeping them in the fridge. As I mentioned above, feel free to change this recipe up a bit. If you don’t like orange, feel free to omit it. 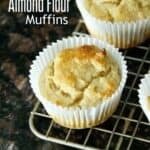 You can also use almond extract instead of vanilla. Whatever changes you decide to make, just be sure your dough is fairly firm and can be made into balls so that you can dip them in melted chocolate. 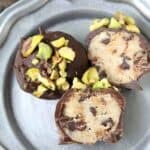 Hope you enjoy these fun Cannoli Cream Chocolate Truffles! 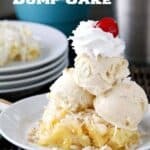 Such a quick and easy no-bake dessert! 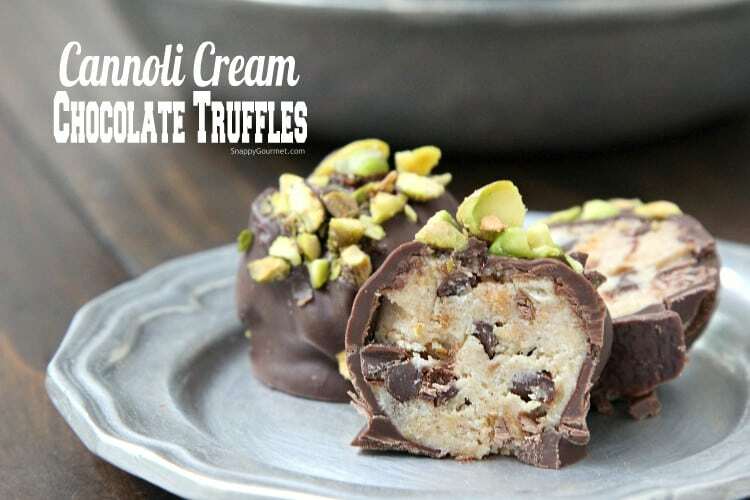 Cannoli Cream Chocolate Truffles, a fun candy based on the popular Italian cannoli pastry. 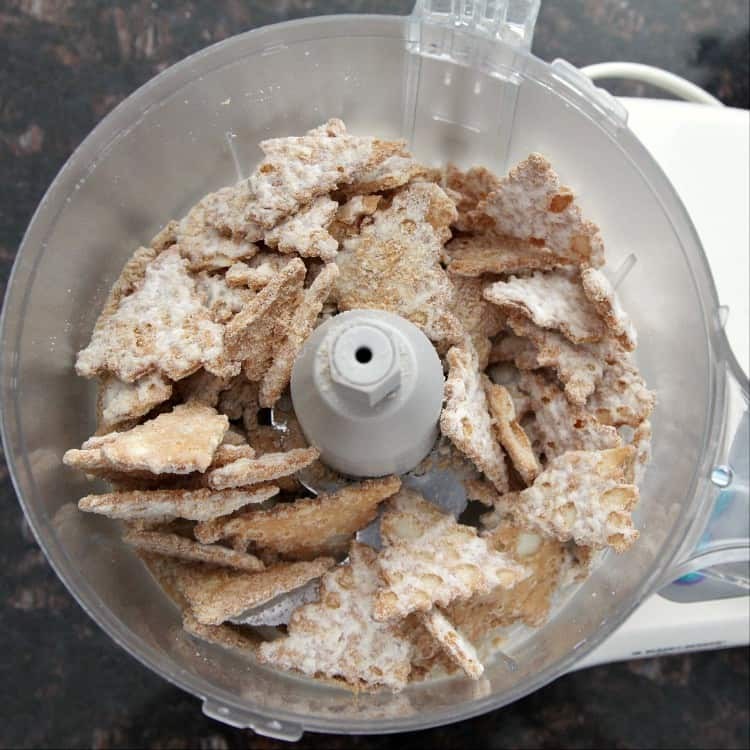 Place Cannoli Chips in food processor and process until coarse crumbs. Mix together chip crumbs, powdered sugar, orange zest, cinnamon, and salt until well combined. 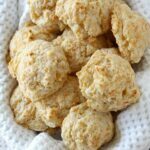 Mix in a little ricotta at a time until soft batter forms. 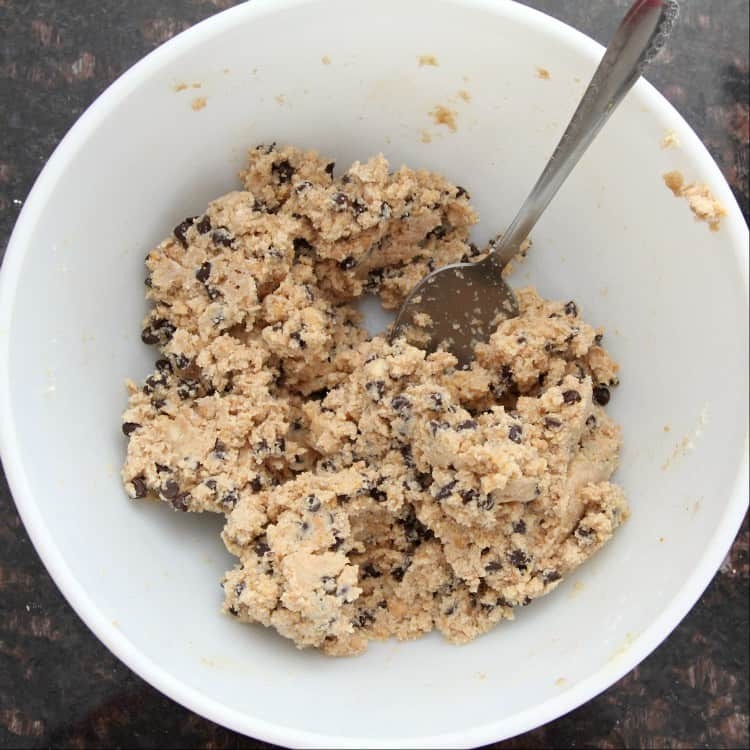 Mix in the vanilla extract then mini chocolate chips. Using a small scoop or spoon, scoop the dough onto a silicone mat or parchment paper-lined baking sheet, then roll each candy in your hand to form a ball. Refrigerate about 15-20 minutes or until chilled and firm. Remove candy from the refrigerator. Using a fork or candy dipper dip each candy in melted chocolate and place back on lined baking sheet. Sprinkle tops with chopped pistachios. Place back in the refrigerator for about 5 minutes or until set. Store in fridge until ready to serve. SNAPPY TIPS: Be sure your ricotta is fairly firm and not too watery. If it's too runny, drain before using. The finished candy balls should be fairly firm so use a little ricotta at a time until everything sticks together. SNAPPY SUBSTITUTIONS: Instead of ricotta, you could use mascarpone cheese. Instead of mini chocolate chips, you could use finely chopped chocolate. Instead of cannoli chips, you could try unfilled cannoli shells, vanilla wafers, or graham crackers but may need to add additional powdered sugar. MELTED CHOCOLATE: I used the remaining mini chocolate chips from what was left of a bag after adding some to the candy. I melted the remaining chips (and a few more) in the microwave with a little vegetable oil. You may need slightly more chocolate to cover all the candy depending on how thick you want the outside shell and depending on how large you make your candy. Some chocolate chips do not melt very well, so you have that problem you can instead use a chocolate bar, candy melts, or chopped chocolate. 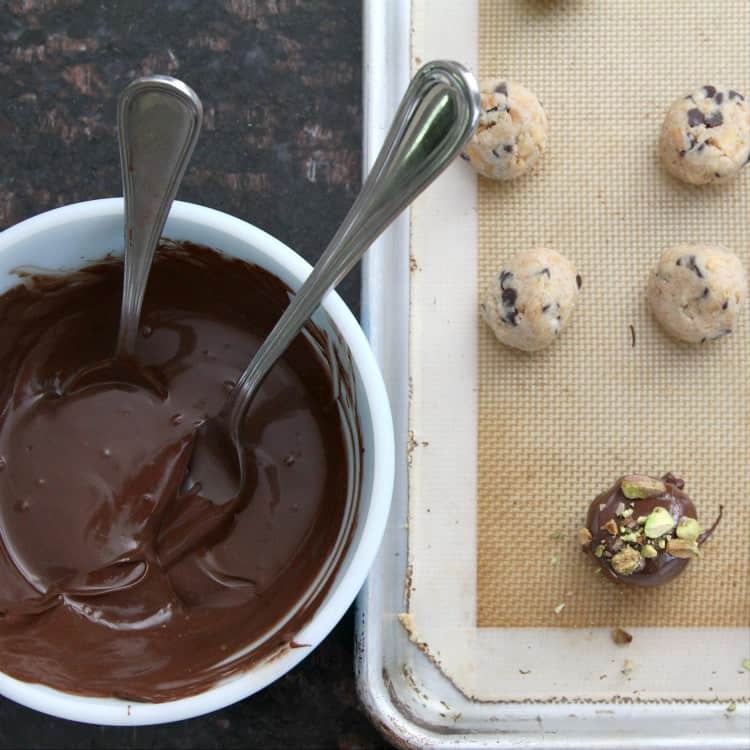 Depending on the size you make these truffles you'll need roughly 2 cups of melted chocolate. These look SO addicting! What a great holiday treat! Love these truffles! They look so good! Love how simple this is and they look just scrumptious! Canolis are my weakness! 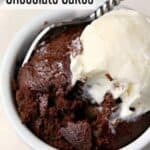 I’m totally making these this year! These look so good! I love cannolis so I’m sure these are delish! 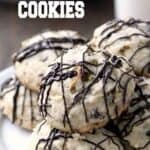 These looks incredible, I’m pretty sure I could eat a million of these! I don’t think I’ve seen anything more delicious looking today! These way make perfect holiday gifts, thanks so much for the great idea! Thank you for introducing me to my new addiction! Yummy! 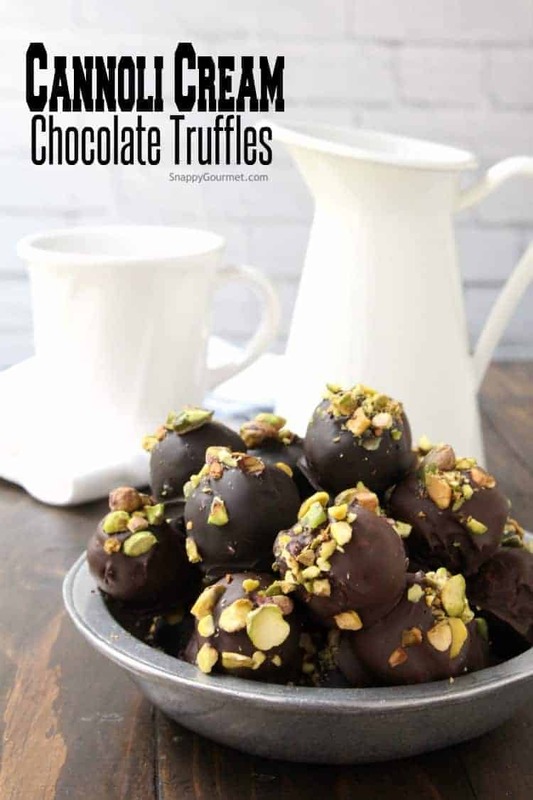 These truffles look so delicious and so easy to make! Great idea for kids too! The addition of pistachios is the perfect touch!!! This look so tasty! I love that they can satisfy my sweet tooth in one bite! I have a friend who is completely OBSESSED WITH cannoli. He literally (jokingly) calls himself The Cannoli Kid. Maybe I’ll be nice and make these for the next time he comes over. I might eat them all myself first… but it’s the thought that counts. YUMMERS! I see these sometime in my future. Thanks, Lisa. Thanks Pat! Hope you like!